I have described my blog as a running commentary on stylish London. For the purposes of this post I am going to throw that concept (stylish) out the window and share with you what is, in my estimation, the best piece of theatre I have seen in a very long time. 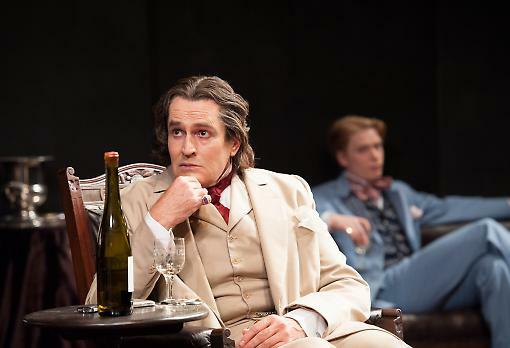 Whether you live in London or plan on visiting before April 6th, you must, I repeat, you must, see The Judas Kiss starring the brilliant Rupert Everett and the extremely talented Freddie Fox. The first half of the play is set in the Cadogan Hotel, where Oscar Wilde awaits imprisonment for the crime of indecency. Surrounding him are his friend and ex-lover Robbie Ross, his current lover Lord Alfred Douglas (or “Bosie”) and a few romping room servants. In the second half, the action moves to Naples. Wilde’s reputation has been blackened and he has spent two years in prison.